Portable game consoles are fantastic things: do-all media players and mini-computers that are actually fun to use, small enough to carry, with powerful capabilities for just a couple hundred dollars. For computer musicians, they’re versatile devices that fit well into music setups, whether sequencing instruments or feeding videos to a projector. There’s only one problem: big developers (Sony, Nintendo) have locked out the ability to make your own software for them. So, if you’re tired of hacking your way around that (though, admittedly, that’s part of the fun), check out the GP32 and GP2X game consoles. They’re powered by Linux, they’re friendly to homebrewers, and they’re looking increasingly useful and powerful. New developments suggest they’ll be even easier to get and put to use. 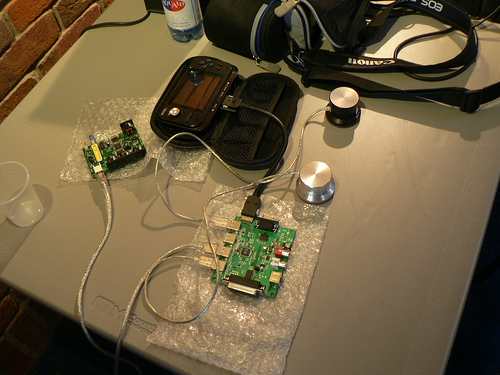 Just like a Linux PC unlocks loads of open source music software, the GP2X has a passionate community following. 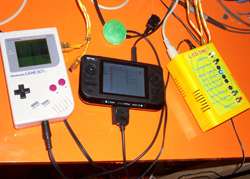 LittleGPTracker is the star for music uses, a traditional tracker based on the fantastic LSDJ for Nintendo Game Boy. Users are already using LGPT to sequence Game Boys, computers, and many other devices. And talk about a community: LGPT has a Wiki, a mailing list, a myspace page, and a livejournal community. These kids today. Here’s where things get really interesting, though: the GP2X can even support USB devices, opening up lots of other possibilities. It’s posing below with Griffin PowerMate knobs. (Thanks to Jay Vaughan for the tip, in CDM comments.) Could USB keyboards be far behind? If you’re looking for a mobile platform to build your own music app, this could be the winner. Of course, you don’t get to raise a pirate flag and think of yourself as a criminal wanted by Sony. But you could code with a plush penguin at your side.